On 5th September 2015, Richard Guest and I visited the Joseph Cornell exhibition at the Royal Academy of Arts in London. We continued to talk about the show via email for a number of weeks. Here is the result of that electronic conversation. David: This show was a show that we were both very keen to see, and I don’t think either of us was disappointed. I wouldn’t say that I loved every piece, but the ones that caught my eye were intriguing, atmospheric and formally perfect. You would need to look at them for a very long time to really appreciate all their qualities. You had a much better idea of his work than I did before we went – I was eager to go based on his reputation. And Cornell’s reputation is very strong among contemporary art audiences …I am curious about why that is. He is much more highly regarded at the moment than say Picabia or even Max Ernst and yet he seems to have been a one-off artist producing work in a slightly insular style. Some of the work in the show was from Jasper Johns’ collection and I think that might be a clue. Although I loathe the expression, is he an artist’s artist? Richard: To American artists, I think he offers a link back to the European artists of pre-WWII – his work was included in Fantastic Art, Dada, Surrealism at MoMA New York in 1936 and he was friends with Marcel Duchamp, who (according to the RA’s exhibition leaflet) considered him one of the best American artists of the day. I can sort of see why he might be more highly regarded than Picabia and Ernst at the moment – his work is, to a certain extent, hands off – Cornell doesn’t create the images or objects he uses, and it’s all about creating meaning and effects through juxtaposition. (So his work is not tied to a particular genre or movement and perhaps by being a one-off his work has a greater appeal, because he’s not so easily categorised. A lot of contemporary art has its roots in Duchamp’s readymades or Pop Art and Cornell’s work speaks a similar, although distinct, language. I can see him being an artist’s artist (and in one piece in particular an ancestor to Julian Schnabel’s painting), but I think he has a pretty broad appeal; the constituent parts of his works are easy to identify, what he’s doing is not baffling, but the magic he weaves is. Shall we talk about Object (Soap Bubble Set)? David: Well when I look at Object (Soap Bubble Set), quite a lot of things are happening at once – I see the overall object on the wall, I can identify particular ‘real world’ objects (the pipe here), I can perceive that some things are not real world objects but images (the shells), I get the reference in the arrangement of them to smoke rising from the pipe, I enjoy the subtle interplay of colours and enjoy the illusion of a frozen moment – movement seems to be stilled here. But there is more…the nocturnal, contemplative atmosphere is beguiling and there is also the strong and unique fascination of the box – which allows all this to come to life, but which we can never enter. Cornell certainly had a strong sense of how to use colour. The limited palette of this piece is stunning. The brown wood of the box and the pipe shaft with the warm whites of the ceramic and the cooler ones of the shells are simply very beautiful against the pure black. I think you’re right that juxtaposition is fundamental in Cornell’s work. And I was struck by how his work seemed to emerge from Surrealism – can’t think of any other American artist who got so much from that movement. 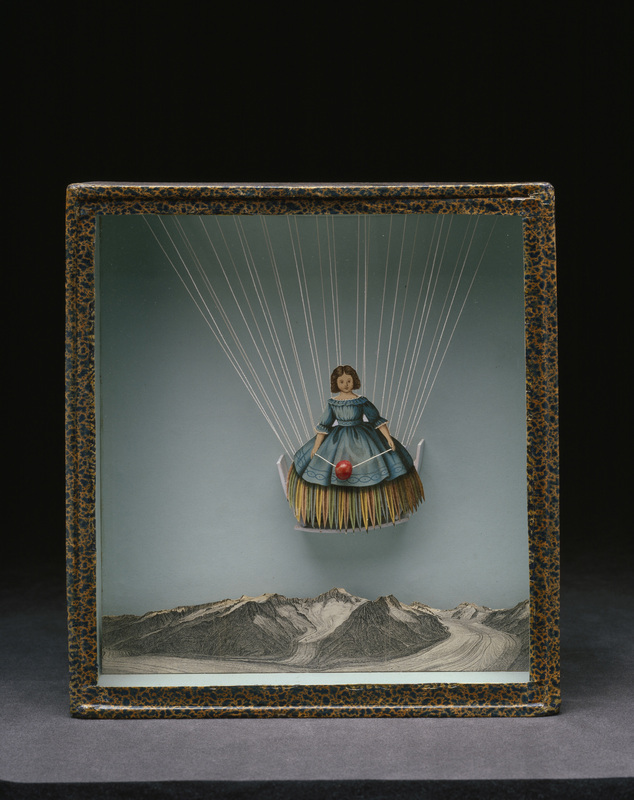 ‘As beautiful as the chance encounter of the sewing machine and the umbrella on the operating table’ – the only working definition of Surrealism for me – gives me a way in to Object (Soap Bubble Set), but that isn’t the whole story. How do you see it? Richard: Cornell took from the Surrealists, but not much of his work (if any) is concerned with eroticism, fetishism or the abject, so there’s a difference in tone – as you say, contemplative. He’s not out to shock. 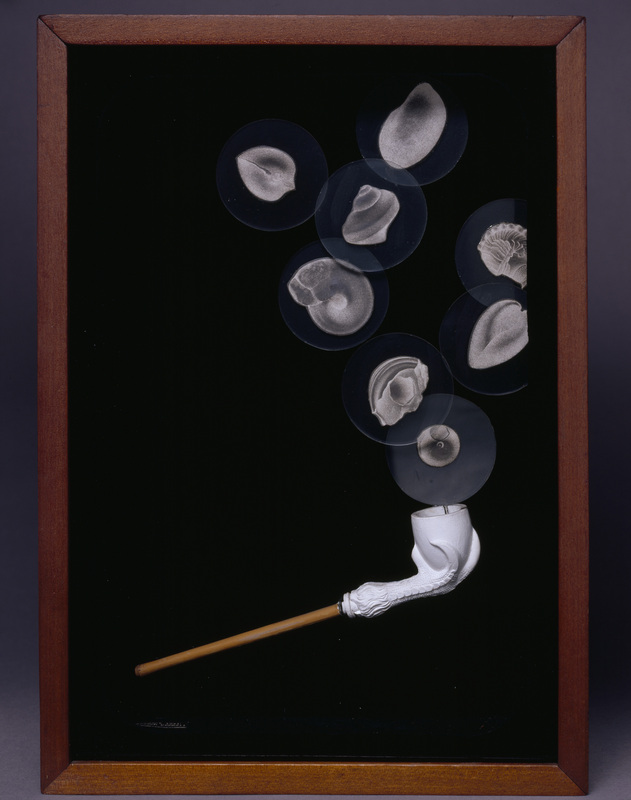 He’s out to seduce and I think Object (Soap Bubble Set) is a very seductive work – it draws you into Cornell’s world. It’s a nice place to start and it was one of the first boxes in the exhibition. Apart from anything else, it’s beautifully composed – and presents itself as a peculiar, frozen moment. I wonder what significance each of the elements has for him, and want to decode the box (even though doing so would probably ruin the work). Does he want us to decode it? David: I think Cornell uses very suggestive objects and images that while not perhaps fetishistic in a literal sense imply subconscious associations that can never be decoded by conscious thought. But I could be completely wrong about that because I know so little about him. I’m not good at decoding anyway. It reduces the power of art in the guise of demystification so that people ignorant of the actual practice and meaning of art (whether critics or art historians) can assume power over it in defiance of established social hierarchies. Perhaps it’s more ‘what sort of question could this be the answer to?’ His work does come from the golden age of psychoanalysis. Some of the works seem to me have a sort of theatrical Doll’s House Asylum quality – stages where puppets of the id and the ego could enact dreamlike fantasies or play out roles trapped in an eternal silence. I am looking at Untitled (Tilly Losch), The inspiration for this could have been an event or a person in his life – I don’t know. What remains in the work is a mute mask like figure, intriguing but distant. How do you see his use of the figure? 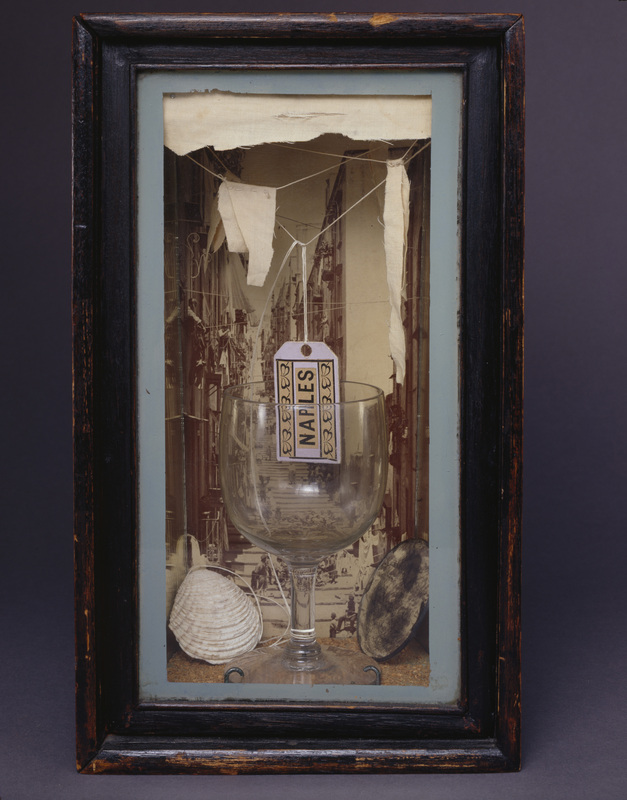 This entry was posted in American and tagged 20th Century, American, Art, Box, contemporary art, Cornell Box, Joseph Cornell, Painting, Sculpture, Surrealism. Thanks for posting this, David – it looks great. I thoroughly enjoyed reading part one of the conversation and thinking about your observations and analyses. Object is so visually fabulous and striking to me in its composition. I agree with David about the effect of the limited palette. And Richard, I think you’ve captured it so nicely when you refer to the seductive quality of the work. David, I like the questions you raise when looking at Untitled (Tilly Losch). I enjoy your conversations about exhibits so much. Cornell is probably much better represented here in the US – I’ve seen his works many times. Do read about him – it will enrich what you see – he was quite the individual!